Some people are slow learners. Some are really slow learners. And then there’s Tim Peterson of Sgt. Peterson’s Boot Camp. 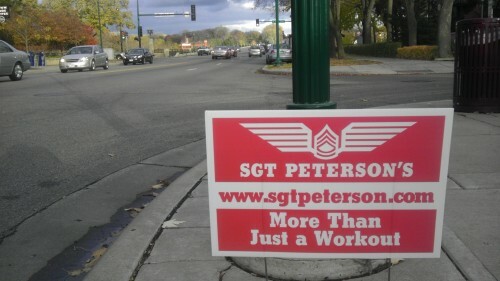 You may remember Sgt Peterson from my June 2011 post about his snipe sign habit. 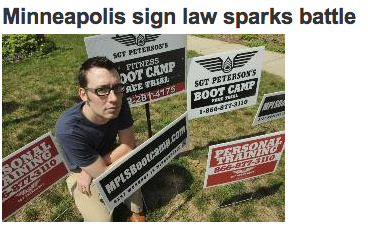 Or, from Aric McKeowen’s June 2011 post titled SGT Peterson’s Boot Camp Knowingly Breaking the Law. I respect you standing up for what you believe in. Many of the things you and the other guy post are inaccurate at best. Please remove the poor things that you say about me and my company. Tim, the win win solution here seems very clear to me. I only write about your illegal snipe advertising when you advertise, illegally, with signs on boulevards around the city. If you didn’t do that, I wouldn’t write about it. All you need to do to solve this problem you’ve created is to stop doing what you know very well that you shouldn’t be doing. Sometime in August 2011, Tim Peterson appeared to get the message. Aric wrote a post stating that the signs appeared to stop popping up around town. I, as promised to Tim Peterson, stopped writing about him spamming the city with illegal signs when he stopped spamming the city with illegal signs. But, it turns out that Tim Peterson can’t help himself based on the snipe sign I found and removed from East Lake Street this week. With so many businesses offering fitness classes in Minneapolis, it can’t be hard to find one that doesn’t litter in our city. * This post title is designed to reach and inform prospective Sgt Peterson’s Boot Camp Groupon buyers about the history of the business they are researching before purchasing a Groupon.